Three-month-old Kyara, the last baby killer whale born at the orca-filled panopticon known as SeaWorld, has died from what park officials believe to be pneumonia. SeaWorld has started to phase out its killer whale attractions (or, really, just make them more “natural”) over the past few years due in part to the success of the 2013 documentary Blackfish, which introduced mainstream America to the park’s horrific breeding practices. And in early 2016 SeaWorld announced they would stop their breeding program, though they still keep and display several orcas in the parks. Kyara, who was born in SeaWorld San Antonio in April, spent her whole life in the park. 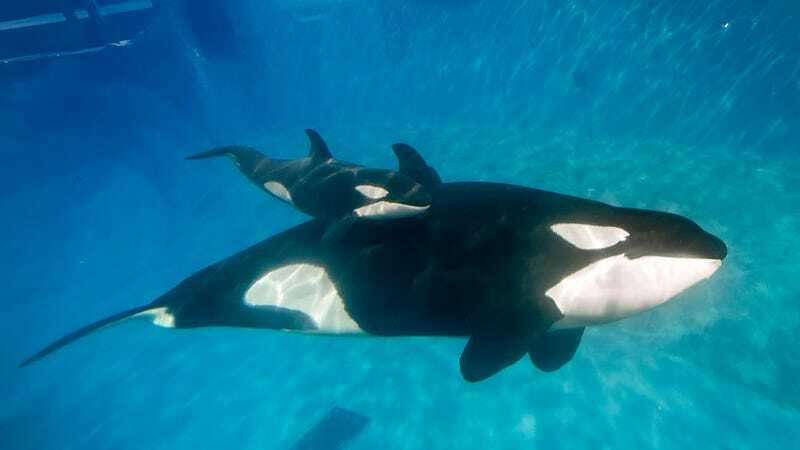 PETA had called for her and her mother, Takara, to be sent to a sanctuary, especially since Takara was pregnant with Kyara when SeaWorld announced the end to the breeding program. Pneumonia, Kyara’s cause of death, is reportedly common among whales who are born both in the wild and captivity. But orcas in SeaWorld live much shorter lives than their counterparts in the wild: female orcas at SeaWorld typically live 12 years, while those in the wild live to 50. R.I.P. Kyara, who knows what your life could have been like had you not been born in a giant fish tank!